"Are you sure you're going to India?" I cannot count how many times I've heard this question of concern when I told my family, friends, and people in the office that I plan to go to India. With the spread of sexual harassment incidents in social media, I understand the fear they felt for me. "Absolutely!" was always my determined answer for everyone. Actually I never even think twice. It has always been a go for me. In fact, the risk made it more exciting. You all know Im a bored woman and I always prefer to take risks. Taj Mahal could be everybody's reason for going to India, but not for me. 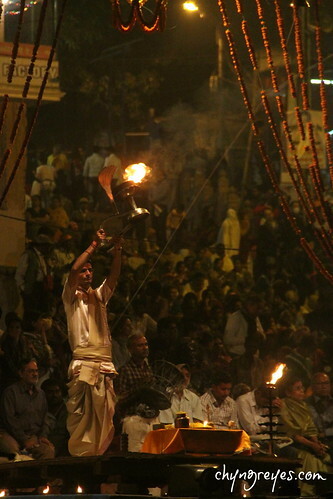 The moment I watched a segment in a cable channel about the holy river of Ganges in Varanasi and how Hindus perform their rituals there - I know one day my feet would drag me in India to witness this upclose. 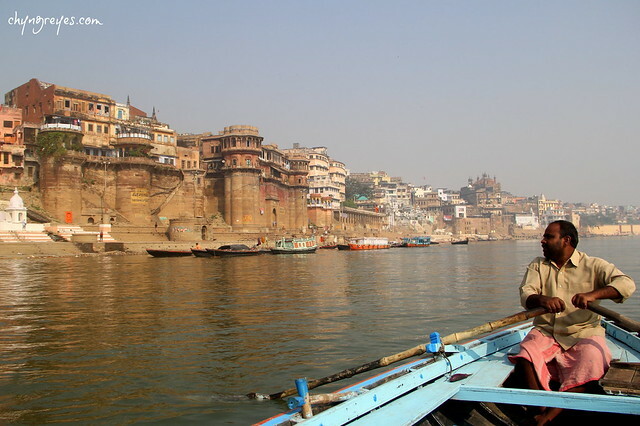 From Delhi, my travel buddy friend Kat took a Spice Jet flight to Varanasi. Train ride is also an option if you have lots of time. 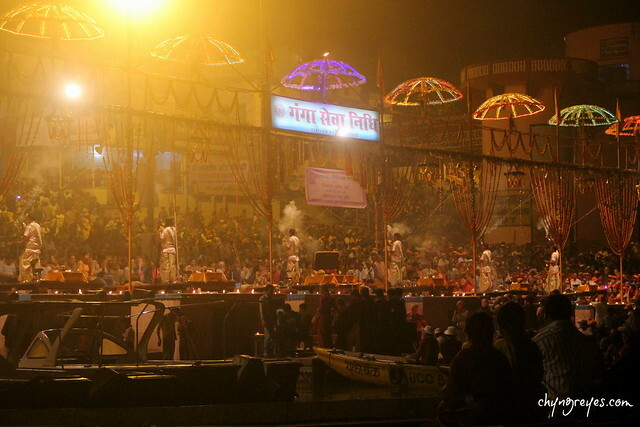 Anyway, we arrived in Varanasi past 7pm and we arranged an airport pick up for a smooth way out of the area. Because the famous hostels in the ghats area are fully booked, we ended up staying at Hotel Central Residency. The staff are polite, the room is clean, there's hot water and free wifi. Location is not bad at all, aside from it's just 50 rupees away from the holy river. The hotel is also walking distance to the malls and fastfoods. 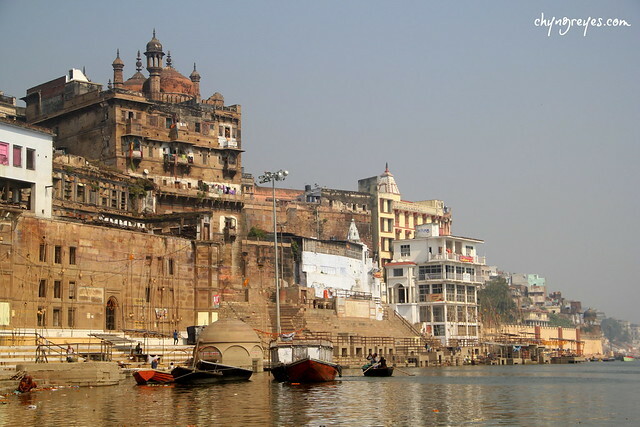 Yes, there are several malls and cinemas in Varanasi. The next morning after breakfast, we took a cycle rickshaw down the main attraction in Varanasi. Cycle rickshaws are not allowed to pass by the main roads, and it's so amazing that our ride passed by the residential village. Omg, every scene was so interesting. Every person we saw seemed has a story to tell. It's so priceless to pass by that residential area. That early, I told to myself, this is the India I really wanted to see. 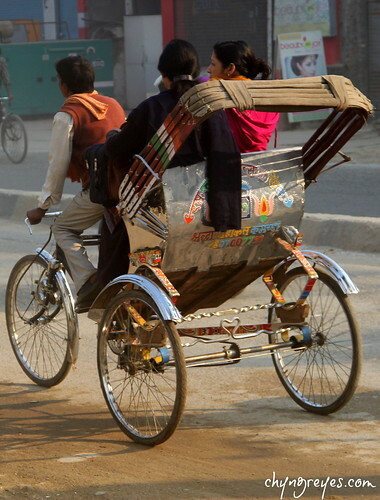 ride a cycle rickshaw instead of an auto rickshaw! Since it could be rude to take photographs of the people in the residential village, I just enjoyed the moment with my own eyes. It's so amazing that I ran out of words. We finally reached the riverside and had a first glimpse of the holy river. Okay, people did stare. Just like here in Manila when you stare at foreigners. Maybe the difference is that the eyes of Indians look intense in some ways - so when you're being stared at, you may feel scared or annoyed or irritated. 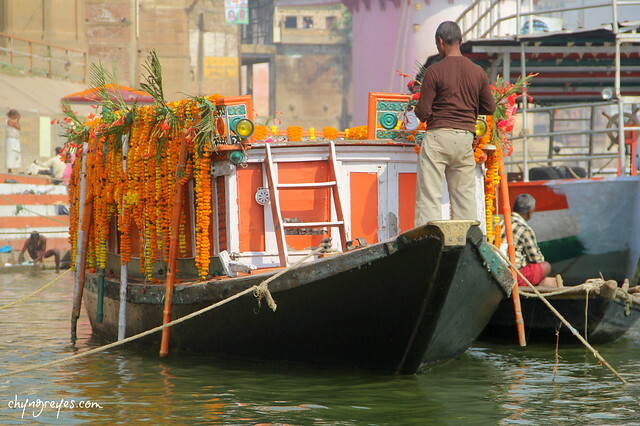 Moving on, we hired a boat for a minimal fee and off we sailed the holy river of Ganges. 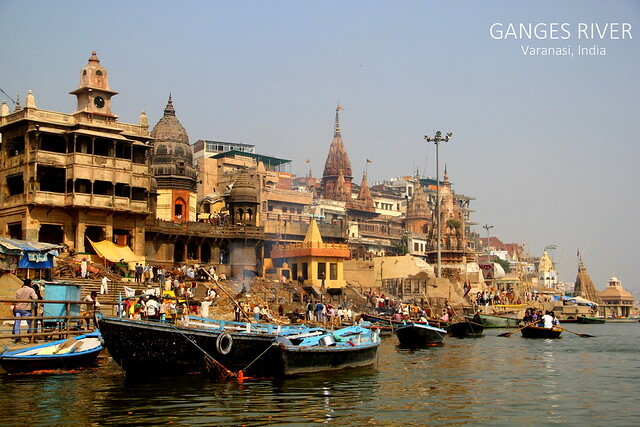 Varanasi is the holiest among the 7 sacred cities in Hinduism, Jainism, and Buddhism. 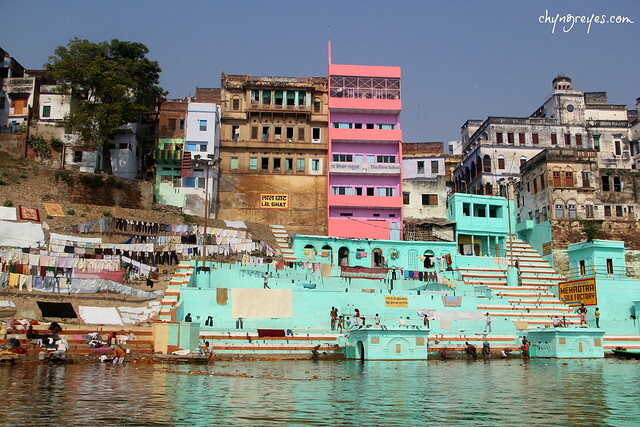 Varanasi is often referred to as "the city of temples", "the holy city of India", "the religious capital of India", "the city of lights", "the city of learning", and "the oldest living city on earth. 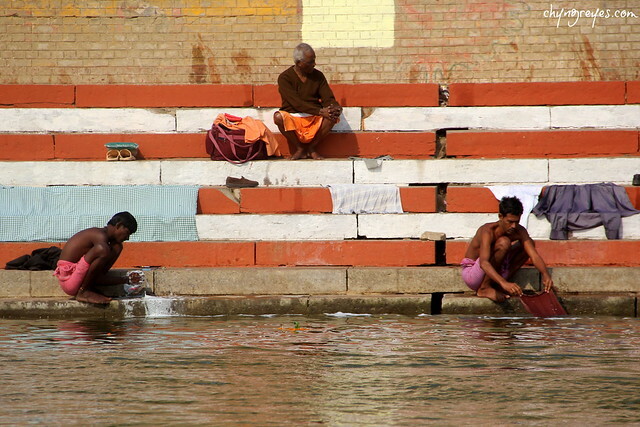 Meanwhile, Ganges is the most sacred river for Hindus. 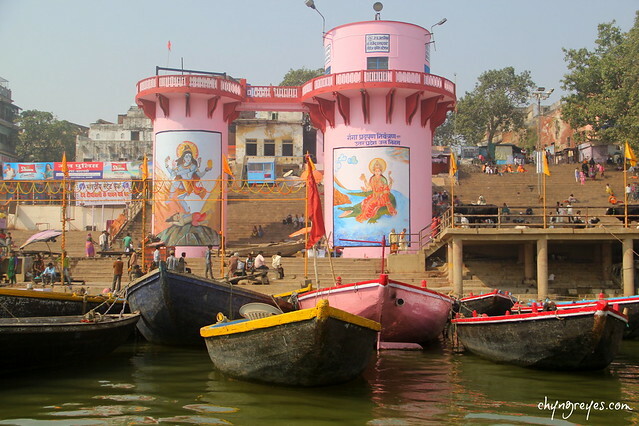 Some Hindus wished to die around this river in belief of salvation. 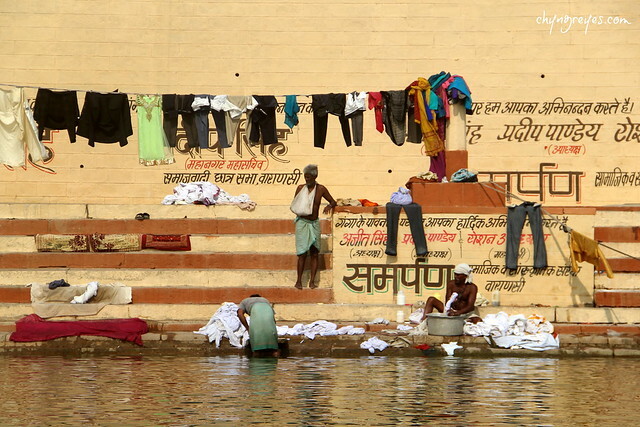 Hindus bathe in this water, say their prayers to their gods by lifting the water and letting it fall back to the river, wash clothes, and even cremate dead bodies here. This is their river of life. I found the "cruise" beautiful, serene, and very interesting. 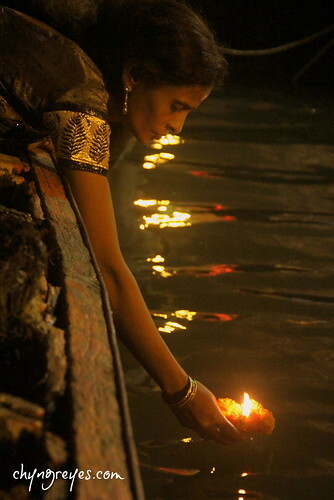 The river is obviously polluted, yet Hindus see nothing but its holiness. I didn't miss the chance to dip my legs into the holy water. It feels normal. Hehe For the record, I asked permission first if I could do this. 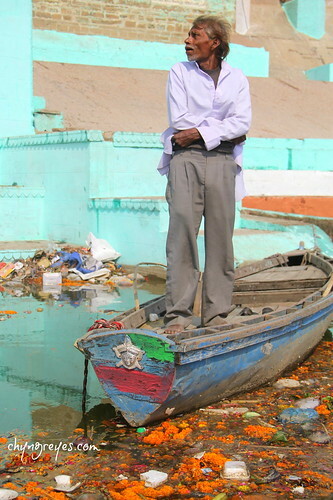 The boatman said there's no problem. 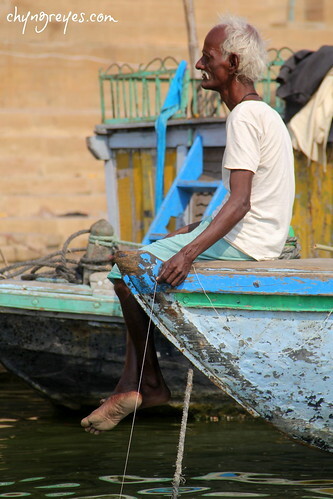 He was just amazed that a lady tourist positioned herself in front of the boat and dipped her feet all throughout the sail. El Nido ang peg?! ^_^ He just told me I should be careful. I told him not to worry because Im from the Philippine islands and boating is so common. Char! It's an overwhelming experience to see how life begins, sustains, and ends in this river. 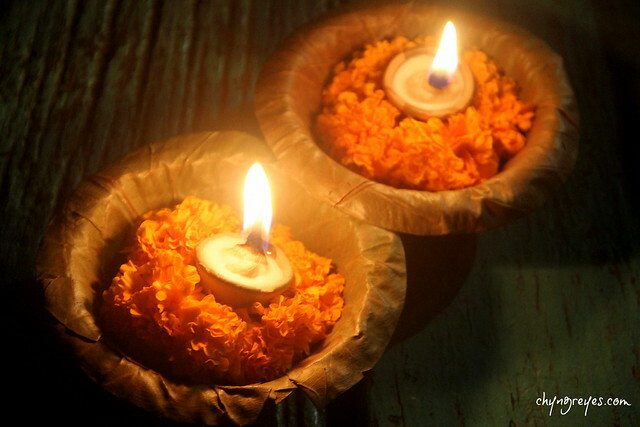 To witness the old ritual of cremation is a once in a lifetime experience. Photos are prohibited as they said, but if you give money to the families, you may take photos even upclose. Eehh? If a Hindu died and cremated somewhere else, the family will still bring the remains and throw this into the Ganges river. They believe that when ashes are scattered in the water, the soul of the deceased will be blessed and will rest in peace for eternity. I couldn't get enough of the experience that's why I convinced Kat that we attend the religious ceremony at night, where 7 priests will perform the ritual. 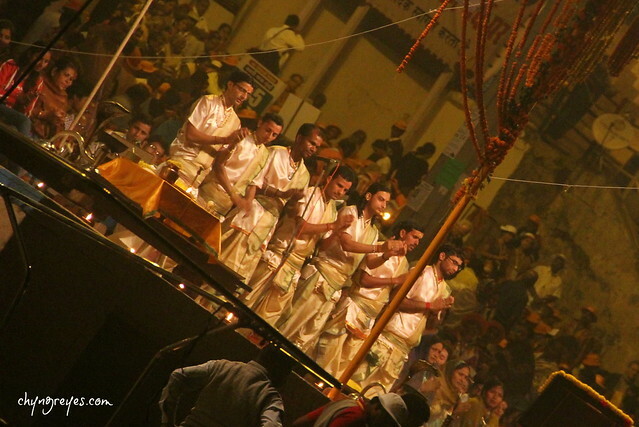 The ceremony is divine and spectacular for devotees and tourists like us. 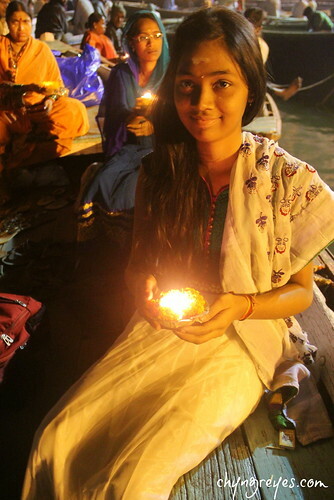 The family from southern India which we shared the boat with willingly discussed this religious ceremony to us. Devotees also did some flower and candle offerings. So we did as as well. After saying the prayer, we were told to float the flower offering in the water. 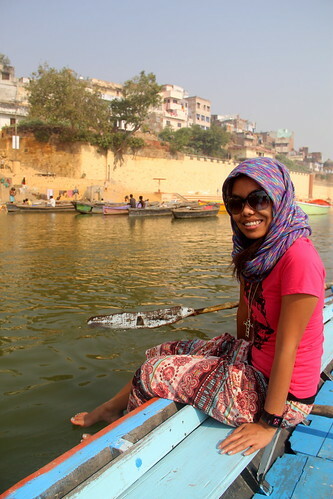 Varanasi is definitely the highlight of my India trip. There's nothing like it. This is a must see. But of course, you can only appreciate this place only if you have an open mind. 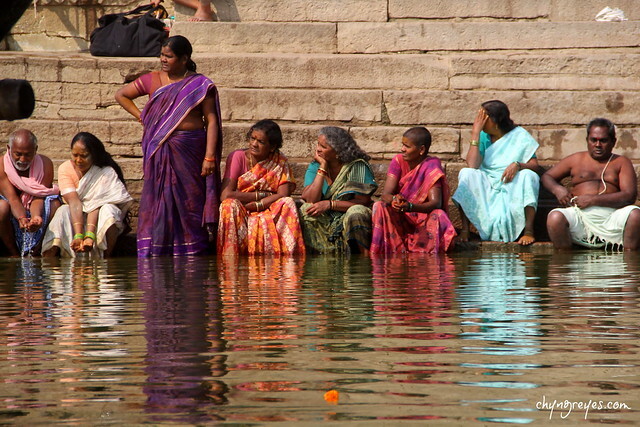 Open your eyes and you would not see the dirt but the colorful and rich culture of India. Wow, what a beautiful experience! the pictures are incredible, pang nat geo talaga. congrats on the trip of a lifetime. Your experience is convincing enough. Pag-ipunan na ito! So amazing! Love your photos! 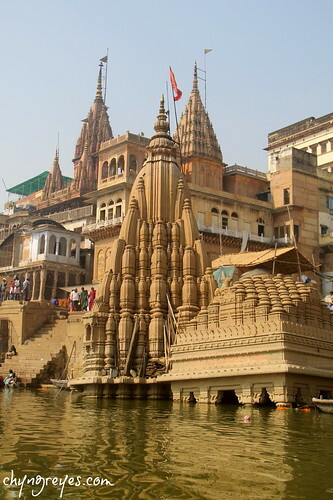 .. your post about varanasi makes me want to go back in india and visit this place. 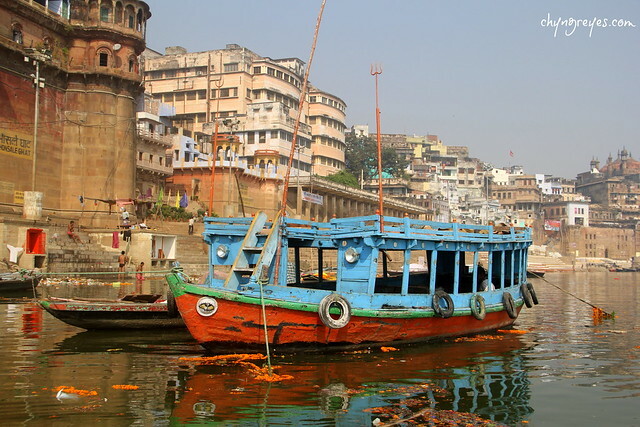 My family also told me the same thing when I shared them the idea of how about a visit to India - which seems not really in everyone's travel list but I agree - open your eyes and you'll see the colorful and rich history of India. Nice travel story you shared. The culture of India is very well captured through your email! Great blog!